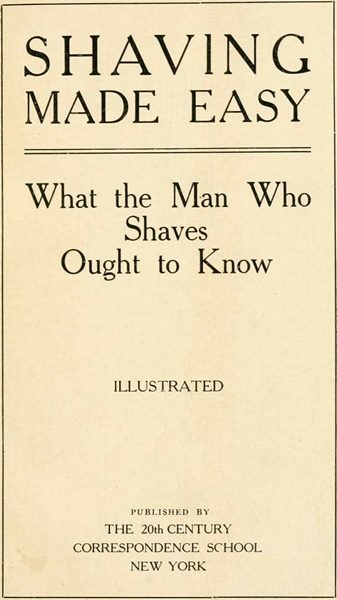 Shaving made easy - what the man who shaves ought to know. Quote: Next to the razor, the most important article of the shaving outfit is the soap. In its proper use lies the real secret of easy shaving. Quote: If you desire a really clean shave, you must go over the face the second time. *) The first DE Gillettes went on sale in 1903 - so when this booklet was written they were very much the new kid on the block. Interesting, Hans ... thank you for sharing this. Thx for sharing, I will add it to my collection. Hans, you posted this in the right place and we thank you for doing so. It's good to know the basics have not changed in over 100 years. Thanks for sharing, Hans! You always seem to find such interesting information! I found out about this on the HTGAM Podcast a while back. Ryan read excerpts from it on the show as well. It's a good read and reference for sure. I tell new shavers about it myself. I picked this up and enjoyed it. One thing that stood out as counter to today's views, though -- if I recall, the book said that if whiskers are too wet/soft, they won't be cut effectively. (08-21-2014, 06:20 AM)Rory1262 Wrote: I picked this up and enjoyed it. One thing that stood out as counter to today's views, though -- if I recall, the book said that if whiskers are too wet/soft, they won't be cut effectively. I hear conflicting opinions on that. It's like the hot vs cold water debate. I say do what works for you. Sometimes people get too analytical. That book is gold to me. Learned so much from reading it. Just downloaded it, thanks for sharing! It is good... It talks about blade flex and how a blade can be deflected by hair ATG causing a weeper but the blade flex deniers will claim this isn't true. Enlightening! So do you use cold water in the cup then? How does this general instruction apply cream soaps? To think I've been working to soften the beard all these years. See no preshave lotion..... but i bet youll notice we fight for those horrid safety razors describef in the book.and pay good money. Nice old book, thanks for sharing the link. Just downloaded and read this book. Fascinating how little the basics have changed for getting a good shave even if the equipment has changed, especially for cart users. Great demonstration of a good technique to stretch the skin taut for shaving, for example. One point I noticed was in regard to lathering: instead of simply working the lather onto the face with the brush for awhile, the book suggested brushing the lather onto the face, then massaging it into the beard with the fingers, and then refreshing with the brush. Does anybody here - maybe among the straight shavers - use that technique?